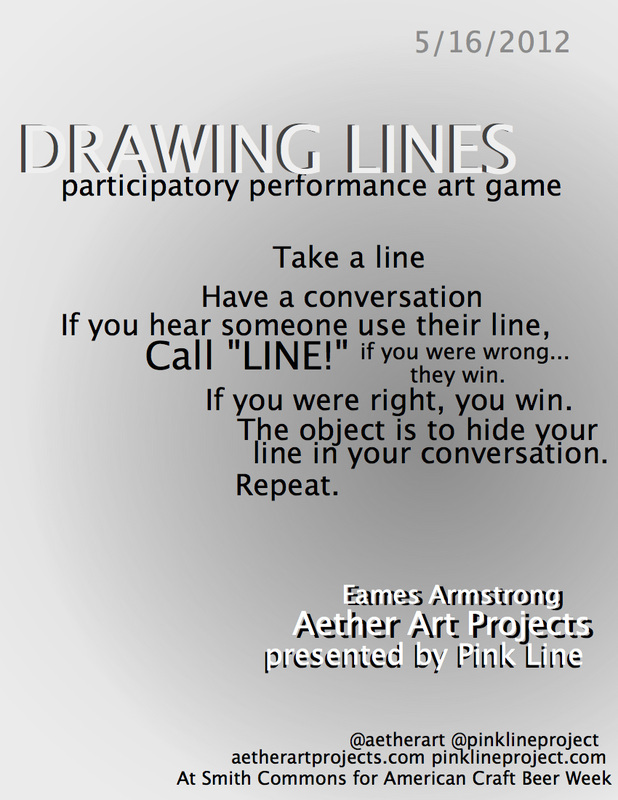 Drawing Lines is an participatory performance game by Eames Armstrong. 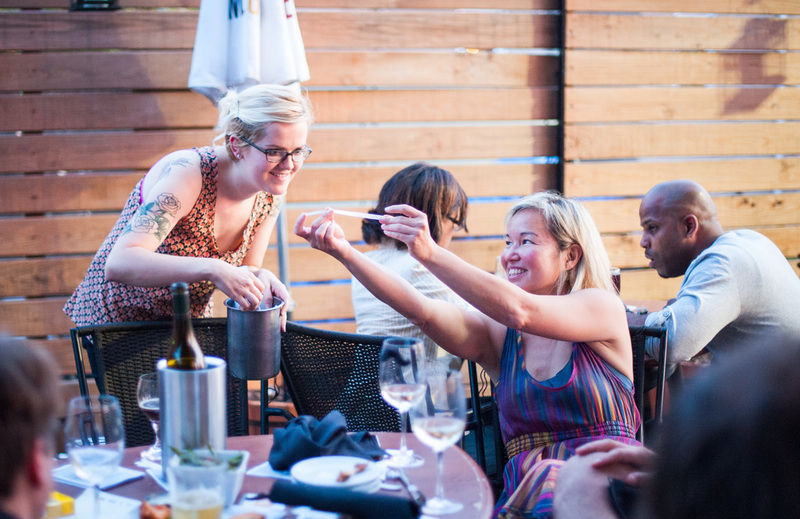 It will take place on the patio at Smith Commons on the Wednesday of American Craft Beer Week. Drawing Lines is a performance piece based on the improv game in which participants are given lines on slips of paper that they have to incorporate into a conversation. The objective is to integrate your line without whomever you're talking to noticing that you've said your line. If your partner calls you out on saying your line, they win. If you successfully slip in your line without them calling "Line!" then you win. The goal is to get people talking. 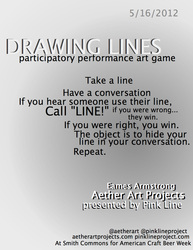 I wrote 180 “lines” for the game, ranging from easier to harder to integrate into a conversation. The idea was to successfully slip your line into your conversation without someone calling you out on saying your “line.” Some were tongue-in-cheek utopian generalizations about art, others critical statements about specific art forms or art in a vague way, lots were questions, lots were statements, lots were stances or positions. A lot were bland positive statements and a lot were antagonistic aphorisms. Some of the lines, particularly the questions, did raise topics that I want to pursue, and were written with real sincerity. Many referenced the game itself, a lot dealt with performance art. 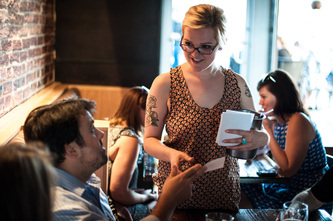 Some were actual quotations, sometimes modified a little to make them more conversational. My intent was to write what I thought were things that I thought someone I didn’t know might say, all relating to or specifically about art. Some were very conversational, and others were thick with art-jargon. I tried to not make any too jargon-thick, to write them in a way that wouldn’t be completely impossible, it wasn’t supposed to be impossible. Particularly in the more difficult lines I imagined that the way to integrate them would be to have to adopt a kind of language-persona, speaking in a way that matched the line, pointing to self-awareness in speech. A couple who played several times, with others as well as just between themselves, told me that it made them self-conscious, it made them aware of the artificiality of everything they were saying to each other, they felt even guilty that their conversation was based on ulterior motives trying to get the dialogue to a place where they say their lines. They totally got it. My hope was that it would do just that- point to the way that conversation is constructed and forced by forcing in these outside lines. I planned the game conscious that it was going to be played in a bar, people would be drinking. I wanted to design something that worked with the elements already present. People, drinking, talking. 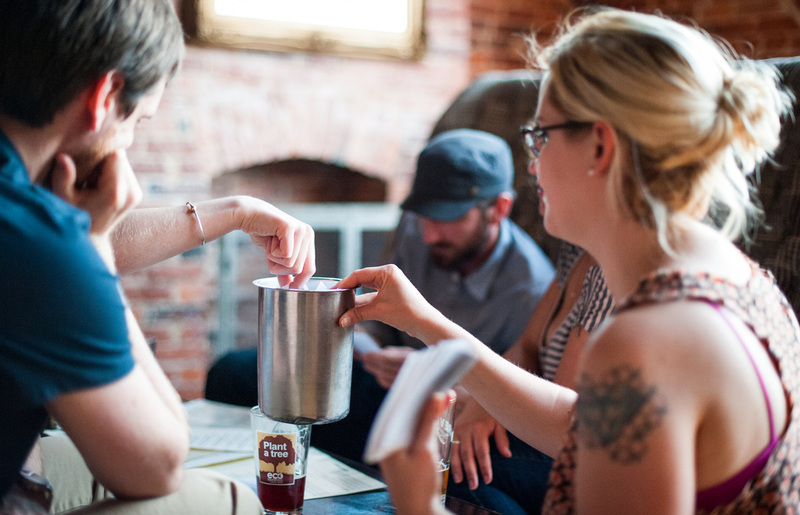 Someone enthusiastically suggested that I adapt the game to be a drinking game, my response, “it already is.” It coincided with American Craft Beer Week, so participants that didn’t come with Pink Line were really there in the first place to drink. At one point, someone wrote their own lines and stuck them back into the bucket, trite sexual statements, teenage-boy clever. Apparently, they weren’t happy with my authoring their conversations and felt the need to insert their own thoughts. Which I kind of appreciated. Because what the piece did was exert control over participants, even if just for a few minutes. Someone didn’t like being out of control and wanted to play with the game, rather than play the game. So- my function as artist, and author, shifted into a directorial role, every participant a temporary actor in my nebulous performance script. Of course, I couldn’t play because I knew all the lines, I wrote them. I enjoyed seeing who got what lines, many seemed providently matched. Although chance figured, the role of chance was slight because the lines were intentionally written. I was surprised that so often the lines were taken at face-value, what I thought was an obvious joke about the way people talk about and idealize art wasn’t always apparently recognized as a joke. For some participants it made the game easier because maybe this statement that I wrote in critique of such a position was exactly the position of the participant. 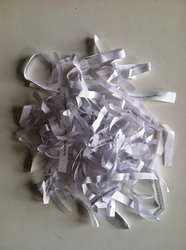 In all, the piece was constructed as something of a social experiment, the goal of which was to see what happens. In the long ongoing trend of artists taking on psuedo-professions, in the game I played sociologist and party host at the same time. Despite the cliché, I got a lot of people talking.